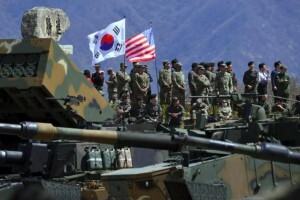 The Korean Marine Exchange Programme was among the training drills indefinitely suspended in June after US President Donald Trump met North Korean leader Kim Jong Un in Singapore and promised to end joint, US-South Korea military exercises. Pompeo, interviewed on broadcaster CBS’s “Face the Nation,” said on Sunday he would be in New York City at the end of this week to meet his North Korean counterpart, Kim Yong Chol. In Washington last week, South Korea’s defence minister said the two countries would decide by December on major joint military exercises for 2019. Vigilant Ace, suspended this month, is one of several such exercises halted to encourage dialogue with Pyongyang, which has criticised joint US-South Korea exercises in the past. “As shown, the US is totally to blame for all the problems on the Korean peninsula, including the nuclear issue and therefore, the very one that caused all those must untie the knot it made,” it said on Friday. South Korean President Moon Jae-in’s continuing efforts to engage with North Korea have fanned US concerns that Seoul could weaken pressure on North Korea to give up nuclear weapons.